Enjoy Staying In A Lovely Apartment With Lanai And Private Drive On Beautiful Grounds. Sunny Open Areas with Tropical Flowers & Fruit Trees Surrounded by Native Ohias Providing unique Nature Setting & Privacy. One Mile From Ocean Clift-side Trails. 25 Minutes From Hilo airport, 35 minutes from Volcano Park, 25 minutes from Kapoho snorkeling tide pools and warm pond. Jade Ohana Is Perfect For The Nature And Bird Lover. 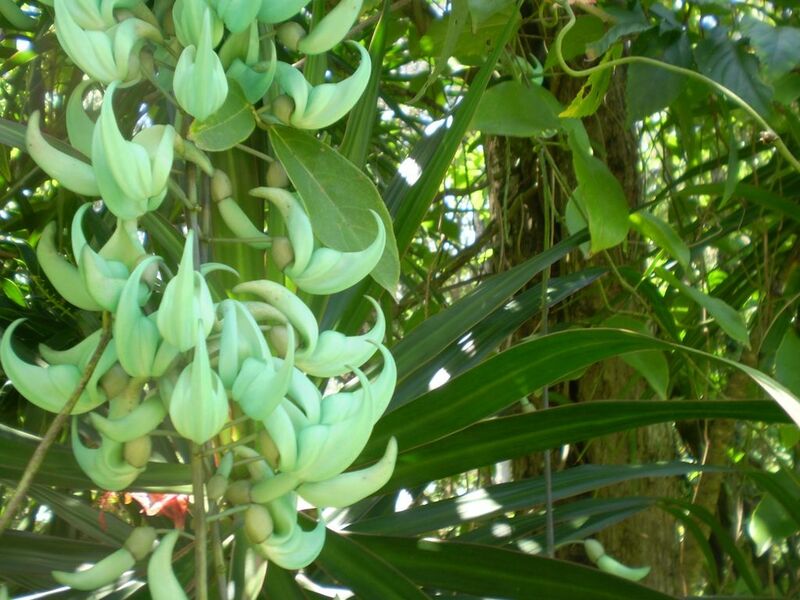 It Is Named For The Beautiful Turquoise Jade Vines Hanging In The Ohia Trees All Around The Property. The Ohia Tree Is Native To Hawaiian And It's Red Lehua Blossoms Are Celebrated In Many Chants And Songs. Also on the one acre are Coconut, Banana, Jackfruit, Breadfruit, Hibiscus, Ti, Bromeliads, Avocado, Orange, Tangerine, Guava, Passion Fruit, Lipstick Tree & Kukui. Fragrant flowers- Puakinikini, Plumeria, Jasmine and Gardenia. This Area Is Unique In All Hawaii For It's Climate, Trade Winds And The Proper Balance Of Temperature, Sun And Rain. Like Camelot It Usually "rains At Night And Shines In The Day." Jade Ohana Is Located In Hawaiian Paradise Park, A Semi-rural/agricultural-residential Development, And Midway Between Hilo And Kapoho's Great Snorkeling And Unique Ocean Warm Ponds.
. On Sundays The Unique Maku'u Farmer's Market, A Few Miles From Us, Has Lots Of Fresh Local Grown Produce, Flowers, Food Vendors, Exotic Clothes, Unique Local Crafted Jewelry And Musicians Providing Music While You Sit At Long Tables Having Breakfast Or Lunch. The Quaint "old Time" Village Of Pahoa Has Lots Of Great Little Restaurants, Thai, Mexican, Italian, And Also Kaleo's -a Charming Gourmet Bistro Featuring Live Music. Check Out The New Tin Shack Bakery In Pahoa. There Are Also Health Food Stores In Pahoa, And Hilo Which Serve Delicious Food Buffet Style. Highway 132 Takes You To 'the Red Road' Where You Will Find A "warm Pond" Heated By Volcanic Waters, Great Snorkeling At Waiopae Tidepools, Kalani Oceanside Retreat (beautiful Grounds And Excellent Food, Dance, Yoga, Massage, Etc. Offerings) And The Unique Red Road Drive Through Magnificent Trees And Jungle Right Beside The Ocean. In Hilo You Can Visit The Beautiful Liliuokalani Park, Coconut Island, Black Sand Beaches, Snorkeling, Museums, Art Galleries, The Palace Theatre, And Lots Of Good Restaurants. Farmers Markets Are Very Popular Here And Can Be Found In Hilo, Keaau And Pahoa. In Hilo, The Major Farmer’s Market Days Are On Saturdays And Wednesdays. The Volcano National Park Is Always A "must Visit" And It Is A 40 Minute Drive. North Of Hilo Is The Hamakua Coast, With Waterfalls, Scenic Drives, And A Beautiful Botanical Garden. There Is So Much To Explore And We Are Happy To Help You Plan Your Journeys. This Is A Non-smoking Facility, However You May Smoke In The Patio Or Yard. Note: Hawaii State Transient Tax Of 13.25% Of Total Has Been Included In Reservation Price. If needed a separate twin size bed or baby crib can be provided. For recreation- I enjoy snorkeling, hiking, camping, yoga and hula dancing. I am also a community activist, planetary citizen, nature lover-conservationist, and practicing some permaculture on my land. Island Eyes Video is my special events video production business. I enjoy getting acquainted with my guests and helping them learn of the many beautiful places and special happenings of our island community. I attended Ohio Wesleyan University two years and then returned to my home state and graduated from University of Kentucky. Dish Satellite TV, also with DVR so can pause, back-up, or fast forward thru ads. We really loved the location with the trees and flowers, and the privacy. The only negative is the small bed. It should be at least a Queen size bed. I loved my stay with Mary in her Jade Ohana. Such a charming, eclectic spot. How Mary keeps her property in such great shape....well I am amazed. She was a charming hostess and very knowledgeable about her little piece of paradise on the Big Island. I look forward to staying with her again soon. Clean spacious bathroom. Just what we needed. On-property owner is very nice and respectful. Unit is small but a good bargain for het very reasonable rental fee. Mary is a welcoming and knowledgeable hostess. The property was beautifully landscaped and the apartment was well equipped for my stay, with fresh fruit from Mary's fruit trees. Garage turned into spare room..no true privacy. I could make this very lengthy and descriptive but there's truly no desire to. If all you're looking for is a place to sleep, then here you go. There's no privacy here but if you can stand the Koki frogs/tenants noise, sleep away. I was quite surprised by Mark's review. Mark said he was from Las Vegas and looking for a place to buy and thus out daily to look at what was for sale. I have no idea what his "privacy concerns" were. While he was here, I was in Kona several days and I hardly talked with him. And certainly was not intruding on his privacy. Mark had said there was "too much noise in Kihei," and I assumed it was urban noise from which he wanted to get away. The chirping of the tiny coqui tree frogs here is loud, and if one wants desert quietness this is not the place to visit. Guests usually stay here to experience nature and a green environment. Most guests love the beauty of the surrounding coconut palms, bamboo, fruit trees, flowers, etc. Also special here are the healthy native Ohia trees that surround Jade Ohana; their lehua blossoms are celebrated in many Hawaiian chants and songs. Jade Ohana was never a garage, has many windows, is pleasantly furnished, overlooks its own garden, and is just as portrayed on my site.